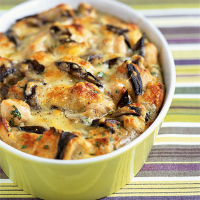 This savoury version of a bread and butter pudding with chicken and mushrooms makes a satisfying midweek family supper. Preheat the oven to 190°C, gas mark 5 and grease a 1.2 litre baking dish. Using a fork, lightly beat the eggs and milk together in a large bowl. Stir in the bread cubes, 75g of the cheese, the parsley and some freshly ground black pepper. Leave to stand for 10 minutes while you prepare the remaining ingredients. Heat half the oil in a large frying pan and brown the chicken for 4-5 minutes, then remove from the pan and drain on kitchen paper. Heat the remaining oil and cook the mushrooms for 3-4 minutes, until just starting to soften. Drain on kitchen paper. Stir the chicken and mushrooms into the egg and bread mixture, then pour into the prepared baking dish. Sprinkle with the remaining cheese and bake for 30-35 minutes until risen and golden and the chicken is thoroughly cooked, with no pink meat. Allow to stand for 5 minutes, before serving with some cooked Chantenay carrots and steamed green beans. For a different flavour, try using an alternative cheese, such as Gorgonzola or a mature Cheddar. Make this dish vegetarian by substituting the chicken with vegetables such as peppers or courgettes, and using a vegetarian cheese.